Should You Build or Buy Security? Creating sustainable cybersecurity solutions for your organization is challenging. Frequently, organizations building out security solutions often face the age old dilemma of build versus buy. For network security solutions, there are numerous open source technologies available that might be a good fit for your organization. But what's really involved in building out a sustainable solution and is it the right choice for your team? 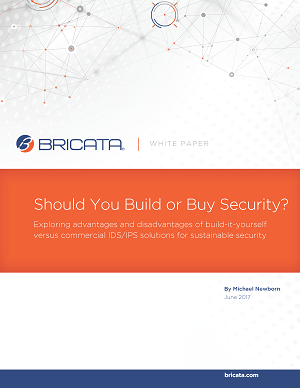 Our new white paper, Should You Build or Buy Security?, will help you evaluate various open source and commercial options. It also provides best practices and tips to get started, as well as guidance on how to plan and scope your project. Make the best choice for your team - download it today.